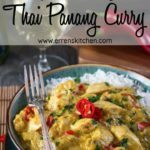 This recipe for Thai Panang Chicken Curry makes the most amazing Thai curry you'll ever make! This scrumptious dish is healthier than a takeout option and best of all - it’s super easy to make. 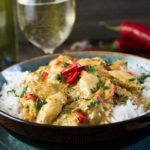 Looking for a simple Thai curry? 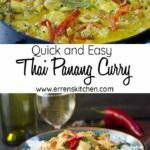 This Quick & Easy Thai Panang Curry recipe is full of vibrant flavor and on the table in just 30 minutes. 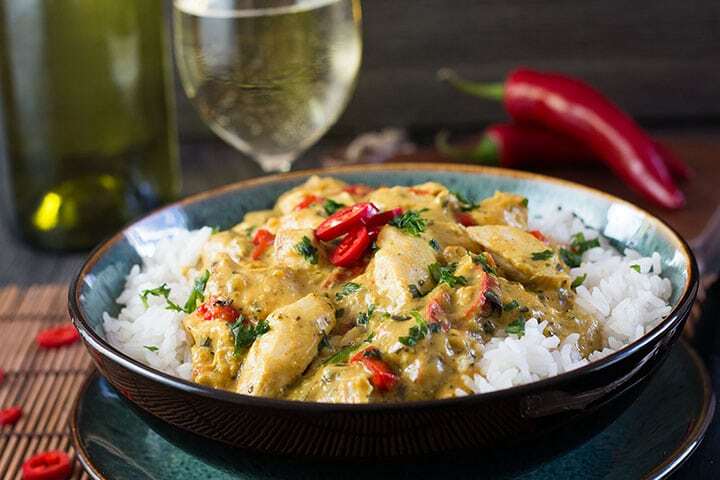 Impress your friends and family with this fragrant and creamy Thai chicken curry. 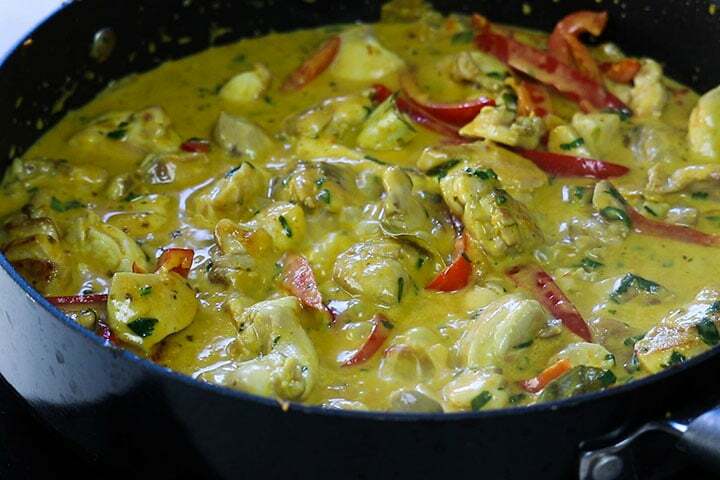 It’s a colorful, zingy curry that is packed full of flavor. 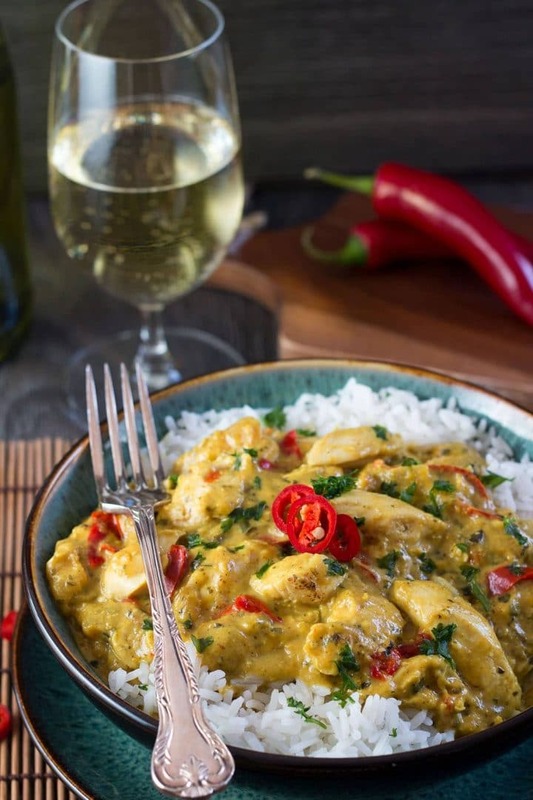 This curry is so simple and easy to make, perfect for busy weeknights. 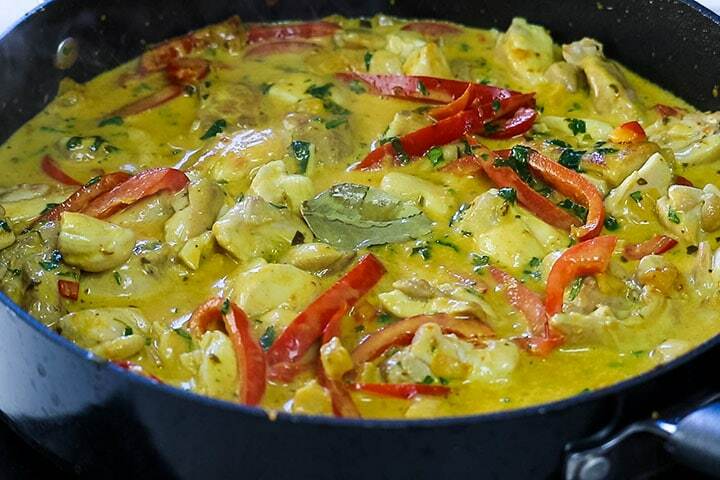 Adjust the heat in this coconut curry and make it as spicy as you like. Experiment with different meats or fish to make this a dish everyone will love. Sometimes you just need a shortcut to a fabulous, homecooked meal. Store bought curry paste is a great shortcut as it’s usually made with fragrant, authentic flavors. So cancel your take-out and make your own homemade version that’s the whole family will enjoy! Start with browning the chicken in some vegetable oil on all sides. Remove from the pan and set aside. 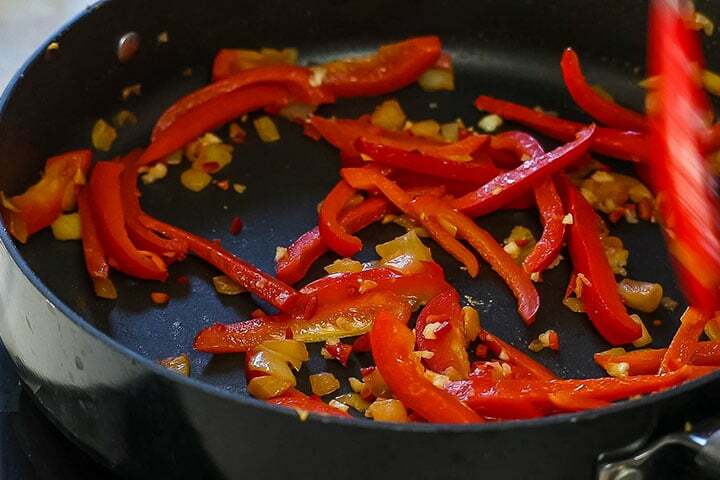 Add sliced red pepper and cook until softened (about 5 minutes). Add the garlic and the chili peppers and cook about 30 seconds. Add the chicken back to the pan. Add the curry paste and brown sugar. Fry until fragrant. Stir in the coconut milk. Stir the fish sauce, lime juice, and zest into the mixture. Add the herbs and lime leaves. Bring to a boil, lower to a simmer and cook until the sauce reduces and the chicken is cooked through (about 10 minutes). Serve on rice and enjoy. 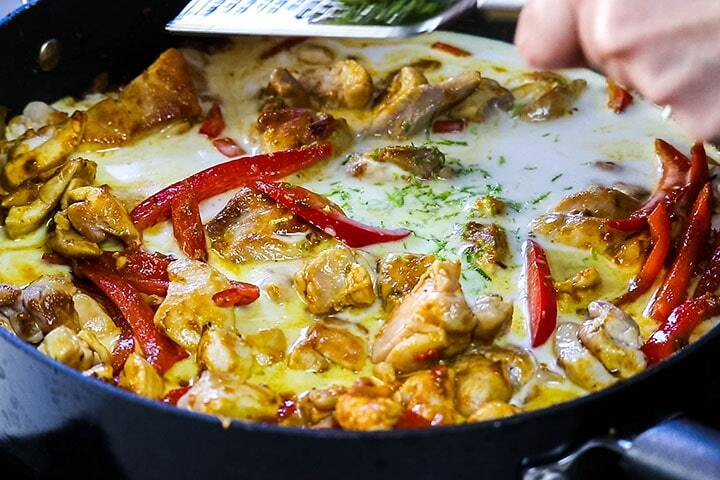 Use Fresh Garlic and Onion – The secret to making fantastic Thai curry is to use fresh aromatics, like onion and garlic. Use full-fat coconut milk it adds a richness you don’t get with the low-fat variety. Kaffir lime leaves can be found dried in supermarkets or fresh in Asian markets, they also freeze well without losing flavor, so you can stock up. You should be able to find Penang curry paste in your grocery store, but if you can’t, it’s well worth a trip to an Asian supermarket or buy it here on Amazon. Feel free to switch up the vegetables, as long as you cut them to be about the same size, so they cook at the same pace. Try green beans, cauliflower, or spinach. Swap shrimp for the chicken for a delicious seafood dinner. Need to use leftover vegetables? Add them to this dish. Want a great starter for this dish? Try this Best Ever Tom Kha Gai Soup recipe from 40 Aprons! 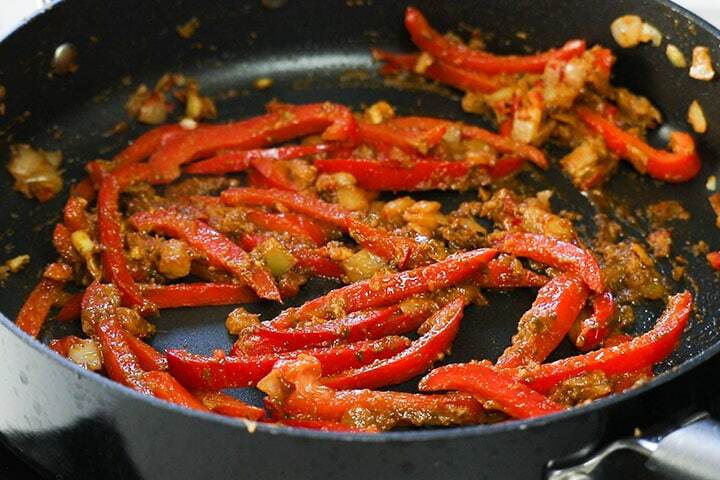 Heat 2 tablespoons of oil in large skillet or wok over medium heat. Add the chicken and brown on all sides. Remove from pan and set aside. 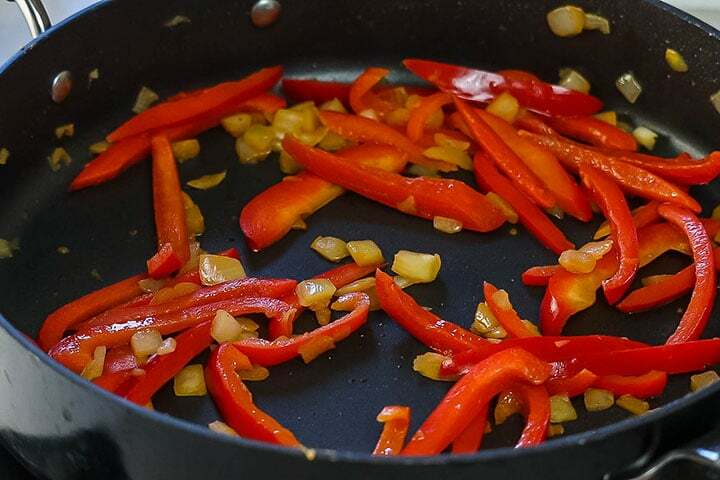 Add sliced red pepper and onion to the pan and cook until softened (about 5 minutes). Add the garlic and the chili peppers and cook about 30 seconds. Add the chicken back to the pan. Add the curry paste and brown sugar. 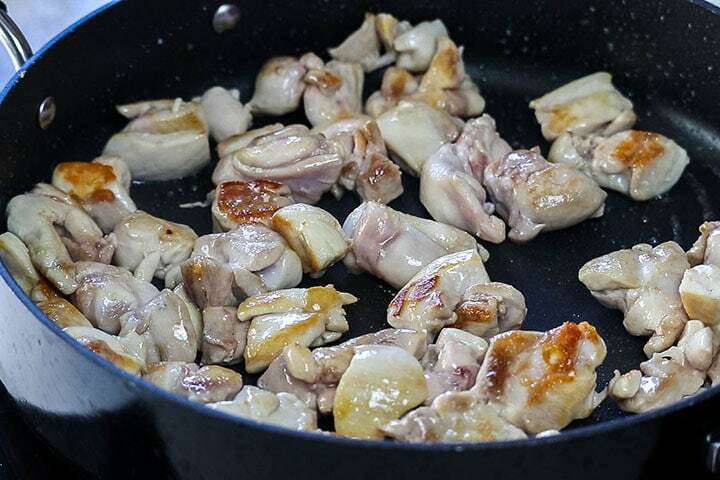 Fry until fragrant. Stir in the coconut milk. Stir the fish sauce, lime juice, and zest into the mixture; Add the herbs and lime leaves. Bring to a boil, lower to a simmer and cook until the sauce reduces and the chicken is cooked through (about 10 minutes). Taste for saltiness and if more is needed, add more fish sauce if necessary and serve. Use Fresh Garlic and Onion - The secret to making fantastic Thai curry is to use fresh aromatics, like onion and garlic. Use full-fat coconut milk it adds a richness you don't get with the low-fat variety. You should be able to find Penang curry paste in your grocery store, but if you can't, it's well worth a trip to an Asian supermarket or buy it here on Amazon. Update Notes: This post was originally published on Oct 9, 2015, but was republished with new photos, step by step instructions, tips, and FAQs in March of 2019. Your feedback TiaMaria has made my day, thank you! Who knew curry could be so easy. I have never attempted to make it because I have been scared. However, you have proven that it is possible for beginners like me. that’s awesome to hear Jacquelyn, Thanks for your feedback! So much flavor! Looks incredible! You had me at quick and easy! My family loves meals like this. Thanks for sharing! Looks incredibly amazing! Love all the flavors going on with this dish, need to put it on my menu!